Can brick, stone and cement block structures be raised? Yes. We have experience working with brick, double brick, stone and solid masonry. We use specialized equipment with hydraulic jacking systems and hydraulic dollies to get the job done safely and efficiently. Can the porch, deck, fireplace and attached garage be moved with our home? It may be necessary to move some of these sections separately depending on the travel route to your new location. We can move your home with or without the fireplace and our estimate will provide pricing both ways. 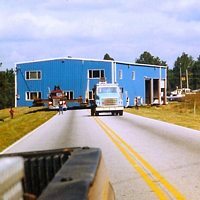 How far can a building be moved? If the travel route is good, a building can be moved practically any distance. When moving a building over one-and-a-half stories high, utility wires may have to be raised along the travel route, which, depending on the number involved, increases the price of the move. Our home sits in the middle of 2 acres near Foley, Alabama, can you move it over to the edge of the property so we can subdivide the remaining property? Sure, we do this often. One client moved their home over a few feet and sold the remaining property to an expanding development. Will the move damage my home? The remedial repairs due to the move is minimal. Sometimes there are stress cracks in the drywall over doorways (but no more than you will see in an average new house that settles). Doors may need to be adjusted but no structural damage will occur. How much does it cost to raise or move a house? Every project is unique and there are many factors that affect the cost and the total price is based on the amount of equipment and crew time required. For an estimate on moving a structure be prepared to answer the questions on the worksheet here. (new window will open). How high can a house be raised? Your zoning rules dictate the maximum allowable height and square foot coverage on the lot. Check with your planning department. Can I add a basement to my home? Yes. We can raise your home and after the basement is constructed the home can be lower into position. 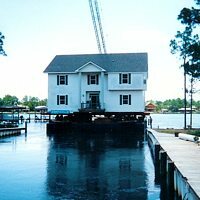 Do I need a permit to relocate my house? Yes, we will advise you as we proceed. What is your service area? We work within 300 miles of Mobile, in Alabama and Mississippi. Are references available? will be happy to furnish references as well as a Certificate of Insurance upon request. No project is too intricate or insignificant! We like challenges.